Ethically Sourced. The Highest Quality Hammocks the World has to Offer. Rest Assured. Breathable, & Light Weight 1.323 lb. Our signature & most popular hammock. The Original Parachute Hammocks With 25+ Years of Experience, We Offer the Highest Quality Materials Combined with the Most Intricate Sewing Techniques. Making Our Hammocks Second to None in the Marketplace Today. An extremely lightweight, easy to use hammock with only one anchor point. This is the lazy boy of hammocks with a reclined feel and a foot rest to stretch out and kick back island style. Perfect sized hammock for traveling. Rated at 300 lbs. It is a compact, lightweight model that will still opens over 5 feet wide, making it suitable for camping and hiking. This is a great hammock to buy as an introduction to the Mayan style hammock but be warned - once you feel what the ultimate comfort that the Mexican hammocks offer, you may find you want to move up to a larger size. This is a good size for those on a budget who want to use the hammock for themselves and maybe an occasional visit from a friend. Rated at 600 lbs. Traditionally woven for two people, but usually two Mayan people who are quite compact compared with some of us from the West! The woven bed expands as wide a 7 feet, yet is still compact enough to take along on a camping trip or picnic. Speaking from personal experience, this is the smallest size I would be willing to select for personal use to get maximum comfort. Weight Support - 550 lb. These are the largest hammocks available and they are as comfortable as you can get with the Mayan Hammocks. Rated to hold a "VW Bug" 1000 lbs. Just because they are the biggest, doesn't mean they are too big for one person either. This is the perfect size if you are just plain greedy for comfort, or alternatively, this can fit a family of four quite comfortably! The open weave design can open as wide as 12 feet. 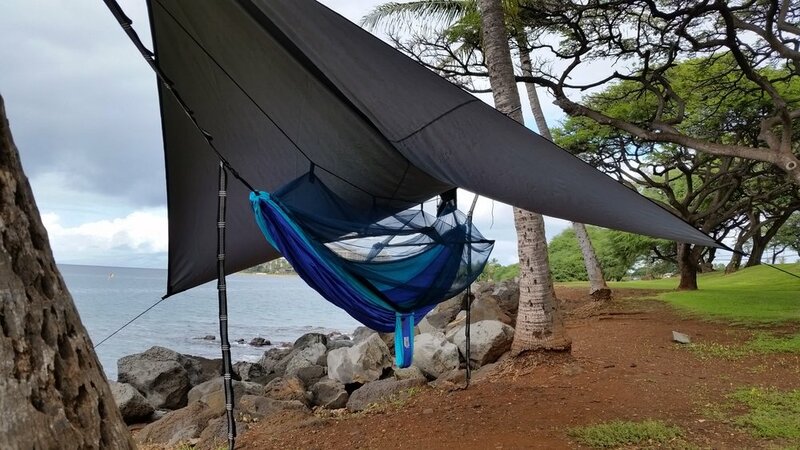 If using for just one or two, the weave is hardly stretched so your hammock will feel like a solid piece of cloth and will also provide for a little extra weave to throw over your legs or wrap yourself like a cocoon on a breezy day. If you plan to spend a lot of time in your hammock or are replacing your bed then we recommend you choose the Big Kahuna / Jumbo hammock. Weight Support - 900 lb. Visit our website ThaiHammocks.com for more in stock color options. Please feel free to contact us as our color options change daily. We prefer to have the artisans create at will, providing a unique piece of art with every hammock. Handwoven with an Improved "Mayan 1/1 Inter Loop Technique"
Referred to as the "Super Jumbo" in size, this hammock is extra comfy for 1 and perfect for 2 people with a weight support of 500+ lb.. Ultra soft, hand woven triple acrylic hammocks can be left outdoors without worry of them losing color or shape. The Thai Laying Hammock Weaving Process Takes up to 2 Weeks to Create. This Weatherproof Hammock is ideal for any Outdoor Area, Great for the Beach or Lounging by the Pool. Luxuriously soft and Comfortable. Come Rain or Shine, you can leave it Outdoors and the Colors stay Bright for many Years. The Thai Laying Hammock is available in many Unique Designs and Colors Not Seen in any other Hammocks in the World. Using the Weaving Technique's of the Mayan hammocks. These are Hand Woven with Ultralight, Weather Resilient, Triple Acrylic Thread. These Hammocks are a Great Addition to any Hammock Lover. Having the Ability to Stretch out Without Limitation, .Allowing the Wind to Pass Through Freely. See Through Your Hammock. The Best Hammocks the World Has to Offer. Breathable, & Ultralight 0.5 lb. A smaller version of our signature hammock with similar specs of quality and construction. Perfect for the littler ones or to be used for storing your gear above ground. Accessorize your hammock to keep the pests at bay. The "360 Net" will protect from above and below. Fits all Hangloose Hammocks. Compact and lightweight. Extremely easy to use with the stuff sack attached. Hand Woven Cotton Hammock Chairs. Perfect for Small Spaces, Tree Branches, in a Doorway, or in the Corner of a Room. With only 1 Anchor Point with the spreader bar or 2 Anchor Points without. Visit our website ThaiHammocks.com for more in stock color options. We prefer to have the artisans create at will. Providing a unique piece of art with every hammock. The "Thai Sitting Hammocks" make great chairs indoors or outdoors. We have many customers using them in the corners of their homes on Maui as island art/furniture. Referred to as the "Sitting Hammock" in size, this hammock is extra comfy for 1 person with a weight support of 300+ lb. Sit down or extend out into a full laying position. Ultra soft, hand woven triple acrylic hammocks can be left outdoors without worry of them losing color or shape. The Thai Sitting Hammock weaving process takes up to 2 weeks to create. This weatherproof hammock is ideal for any outdoor area, great for the beach or lounging by the pool. Luxuriously soft and comfortable. Come rain or shine, you can leave it outdoors and the colors stay bright for many years. The Thai Sitting hammock is available in many unique designs and colors not seen in any other hammocks. Replaces a Tent at 2 lb. The ultimate camping hammock. With an attached bug net. Get in and zip up, or flip it over and let the bug net hug the bottom to be used net free. Again, these are produced to a much higher degree of quality than any other similar looking hammock on the market today. The highest density of netting will keep out the smallest of pests. Another accessory for your hammock that will keep you dry, shaded from the sun and or blended in with your environment. The "Waterproof Canopy" is a perfect piece of gear with many different functions. Ultra soft and lightweight. These hammocks are made on a mechanical loom, and then hand braided along the sides for an added look of beauty. Using a performance yarn which is a weather resistant material, giving you years of vibrance. The material does not mildew and is resilient to UV rays. WE LET THE ARTISANS CREATE AT WILL. EVERY HAMMOCK IS A UNIQUE BLEND. COLORS MAY VARY.